Looking to update our extension? Great! It only takes a few minutes. Which do you need instructions for: Magento 1 or Magento 2? Your extension can be updated in Magento Connect one of two ways--either automatically, or manually. Sometimes, due to the release time required from Magento Marketplace reviews, when we make a feature available in Recapture, it requires a delay from Magento to review the extension prior to release. We don't have a way to control that or speed it up, but we do offer a way to manually update your extension here so you don't have to wait for them! A note about "the automatic way": This method works best when we've released the extension and it's available on the Magento site. It won't work when our extension is being reviewed for release, which can take up to 6-8 weeks from the time we make features available. If you find there's no update available for your M1 connector, it means you'll need to do the manual method instead. Skip these instructions and jump there. Log into your Magento installation and navigate to System > Magento Connect > Magento Connect Manager. For security reasons, Magento will ask you to log into your admin account again. 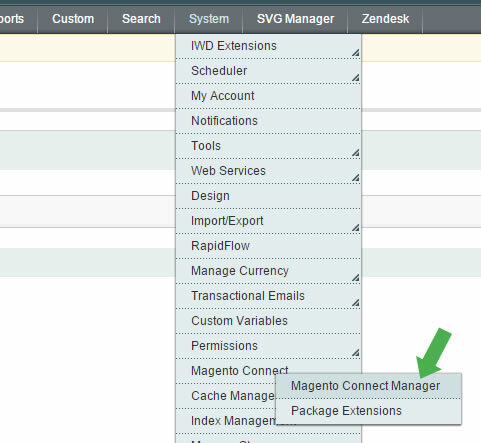 You will then be taken to the Magento Connect Manager page where you can update the extension in just a few clicks. Scroll down to the section called Manage Existing Extensions, and click the "Check for Upgrades" button. Our extension is called 'recapture'. If an upgrade is available, it will be retrieved from Magento Connect and you will be able to select which version to install. Select the newest version from the dropdown list. Magento will install the new version of the extension and show a success message. Click on Refresh and you should now see the upgraded extension listed under Manage Existing Extensions. Navigate to your cache and click Flush Cache Storage at the top right. A note about "the manual way": This manual method works best when we've released the extension and it's NOT YET available on the Magento Connect site. We do this when our extension is being reviewed for release, which can take up to 6-8 weeks from the time we make features available. If you find there's an update available for your M1 connector from Magento, you can probably just update it there more quickly. But if not, you'll need to do the manual method instead. As of Oct 2018, the current version of the extension for M1 is 1.5.8. If you have any earlier one, you will want to update it. Note: This is a more advanced installation that requires SSH usage. If you are uncomfortable using SSH to install extensions, please consult with your developer. Navigate via SSH to the root of your Magento 1 installation. 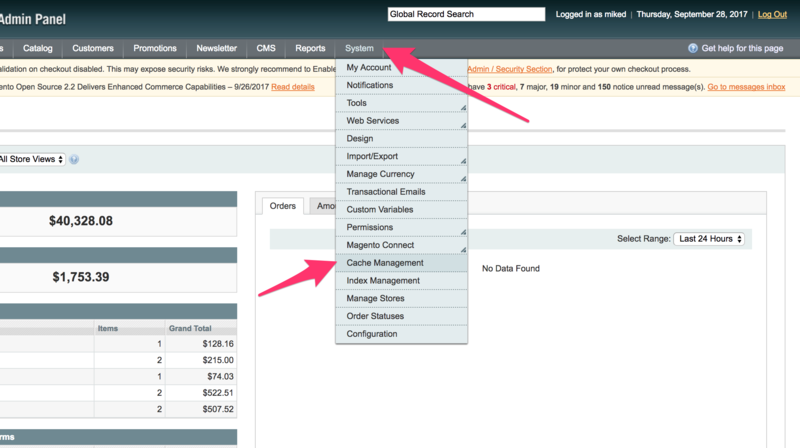 When the extension finishes installing, return to your Magento admin and navigate to System > Cache Management. Click the Flush Cache Storage button at the top right. Your extension can be updated in Magento Marketplace one of two ways--either automatically, or manually. Sometimes, due to the release time required from Magento Marketplace reviews, when we make a feature available in Recapture, it requires a delay from Magento to review the extension prior to release. We don't have a way to control that or speed it up, but we do offer a way to manually update your extension here so you don't have to wait for them! A note about "the automatic way": This method works best when we've released the extension and it's available on the Magento site. It won't work when our extension is being reviewed for release, which can take up to several weeks from the time we make features available. If you find there's no update available for your M2 connector, it means you'll need to do the manual method instead. Skip these instructions and jump there. Click on Add to Cart and follow the checkout procedure. Don’t worry the extension is free of charge. If you do not have any access keys in your account click on ‘Create A New Access Key’ to generate a new public and private key then keep the page open, we will need them shortly. Magento will now make a backup of your installation in case there is a problem with the installation. It is highly recommended you perform this backup. Click on the ‘Create Backup’ button at the bottom of the page. Once the backup has been created click on the ‘Next’ button to continue the installation process. Click on the ‘Install’ button to start the installation. You’re Done! The Recapture Connector is now installed on your Magento website. A note about "the manual way": This manual method works best when we've released the extension and it's NOT YET available on the Magento site, OR when you installed the Recapture extension manually to start with. We make the manual update available when our extension is being reviewed for release, which can take up to 6-8 weeks from the time we release. If you find there's an update available for your M2 connector from Magento Marketplace, you can probably just update it there more quickly. But if not, you'll need to do the manual method instead. As of Oct 2018, the current version of the extension for M2 is 2.4.6. If you have any earlier one, you will want to update it. 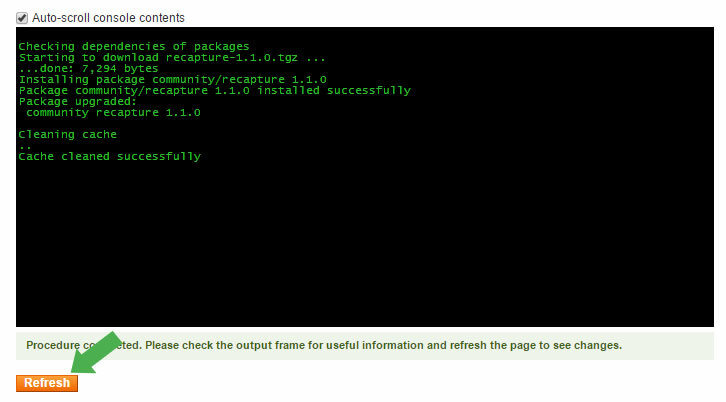 Navigate via SSH to the root of your Magento installation.